Le Stanislas Sextet, qui réunit les membres du Quatuor Stanislas et deux musiciens américains, le violoniste et altiste John Fadial et son épouse la violoncelliste Beth Vanderborgh, a fêté ses vingt ans d’existence en 2016. C’est en effet en 1996 qu’ils ont donné leur premier concert salle Poirel à Nancy, suivi d'une tournée aux Etats-Unis, qui les a conduit successivement en Virginie Occidentale, en Caroline du Nord, dans le Maryland, et enfin à Washington, où leur interprétation du premier sextuor de Brahms a suscité l'enthousiasme du critique du Washington Post. Depuis lors, le Stanislas Sextet se produit régulièrement des deux côtés de l'Atlantique, avec un succès non démenti. Entre 1997 et 2000, il anime l'Académie Franco-américaine des cordes, qui se tient successivement à Mirecourt, berceau de la lutherie française, et à l'Université de West Virginia. En 2006 et en 2009, le Stanislas Sextet est invité pour des résidences à l'Université de Caroline du Nord à Greensboro, ainsi qu’à la Queens University de Charlotte, où il alterne classes de maîtres et concerts. Le concert donné au Fine Arts Museum of North-Carolina à Raleigh a été salué par un article particulièrement élogieux de Classical Voice. En 2011, c’est à l’Université du Wyoming, où John et Beth sont désormais professeurs, qu’ils se retrouvent pour plusieurs concerts et masterclasses. Pour célébrer les vingt ans du Stanislas Sextet, John Fadial et Beth Vanderborgh ont effectué une résidence de plusieurs mois à Nancy en 2016, au cours de laquelle ils ont donné avec leurs amis du Quatuor Stanislas de nombreux concerts, ainsi que des classes de maîtres au Conservatoire Régional du Grand Nancy. The Stanislas Sextet comprises of the Stanislas Quartet, augmented by two American musicians, the violinist and viola player John Fadial and the cellist Beth Vanderborgh. I'm very familiar with the Quartet from their recordings of the Ropartz String Quartets and their more recent cycle of those by Henri Sauguet, the latter of which I reviewed only a few months ago (review). They were founded in 1984. Ten years later in 1994 they got together with Fadial and Vanderborgh in Nancy, France, to explore the sextet repertoire. The result was a concert two years later in the Salle Poirel, Nancy followed by an American tour. Since that time, they've performed on a regular basis on both sides of the Atlantic. In October 2006 and 2009 they had a residency at the University of North Carolina in Greensboro. This release captures them in live concerts given between 2006 and 2016. John Fadial's two arrangements were performed in Nancy in May 2016 as part of their twentieth anniversary celebrations. With the shadows of Haydn, Mozart, Beethoven and Schubert looming large, Brahms deferred writing for the string quartet in his twenties until much later. Instead, he opted for the string sextet as a form which carried far less historical baggage. The B flat Sextet, Op 18 dates from 1860; the G major Op 36, followed five years later. The Stanislas Sextet fully capture the youthful ardour and passion of the Op. 18. The composer had fallen in love with Clara Schumann, but their relationship was never consummated. He dedicated a piano transcription of the second movement to her. In this performance the dark, world-weary second movement theme on the viola ushers in some finely characterized variations, capped off with an exquisite coda. The Scherzo's rustic mien is emphasized. The finale is sunny and good-natured. No. 2 in G major, Op.36 isn't as melodically generous as its predecessor and is more serious in demeanour. I've always felt that it doesn't reveal its secrets as easily. Maybe the more introverted nature of the music reflects the composer’s personal situation at the time. Brahms had brought closure to a failed relationship with Agathe von Seibold, whom he’d met in 1858. He seemed to lack the ability to commit himself in relationships, which led to the affair ending unhappily and he remained single for the rest of his life. He wove the letters of Agathe’s name into the second theme of this opening movement, afterwards declaring to a friend “I have freed myself from my last love”. The Stanislas Sextet bring buoyancy to the pizzicato accompaniment of the Scherzo second movement. The Adagio is suffused with longing and sadness, before a finale of animated restless energy. John Fadial demonstrates that he's a more than competent and highly imaginative arranger, and we are treated to two of his efforts. 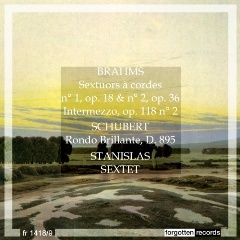 Whilst I could imagine the Brahms Intermezzo adapting well, I approached Schubert's Rondo Brillant with a certain amount of scepticism. My doubts proved unfounded; the arrangement is very effective. I have to admit that I actually prefer the Brahms Intermezzo, Op. 118, No. 2 in this incarnation than in its original piano version; it seems almost tailor made for this treatment. I applaud John Fadial's efforts in further augmenting the string sextet repertoire, which isn't exactly brimming over. Documenting various occasions, these live performances emerge as clear and vibrant, and withstand close scrutiny. Extraneous noise from the audience is minimal; applause has been retained. Forgotten Records have provided a brief biography of the ensemble in French and English. All told, these vibrant readings are well worth your attention. The Stanislas Sextet associates the members of the Stanislas Quartet and two American musiciens, the violonist and viola player, John Fadial, and the cellist Beth Vanderborgh. They met in Nancy in 1994 and decided to explore together the magnificent repertoire for string sextets. In 1996 they gave their first concert in the Salle Poirel in Nancy, followed by a tour of America, which took them successively to West Virginia, North Carolina, Maryland and finally Washington, where their interpretation of the first sextet of Brahms was particularly appreciated by the critic of the Washington Post. Since then the Stanislas Sextet has regularly performed on both sides of the Atlantic, with undeniable success. Between 1997 and 2000 it led the French-American Academy of Strings, which takes place successively in Mirecourt, the cradle of French string instrument fabrication, and the University of West Virginia. In October 2006 and 2009, the Stanislas Sextet was invited in residence at the University of North Carolina in Greensboro, where master-classes alternated with concerts in Greensboro and in other towns in North Carolina. The concert given in the Fine Arts Museum of North Carolina in Raleigh, capital of the State, resulted in an enthusiastic article in Classical Voice. The Stanislas Sextet has celebrated his 20th anniversary in 2016 in France, giving several concerts Salle Poirel in Nancy, and some masteclasses at the Conservatoire.